After Emed64 v18.4.93 (I did not tested v18.4.92 ), the word spacing display got problem, it seems too crowded. Please refer to below pic. Which font are you using? Are you using DirectWrite? Win 7 64bit, did not use DirectWrite. It will happen during change the font size from 12 to 16. I tested with Microsoft JhengHei UI 12 to 16 on Windows 7, but I didn’t not see any issues. Please restart Windows if you have not tried yet. Can you check if “Character Space” is set to 0 or larger in the Display page of configuration properties? Can you also try 1 or larger for this option? “Character Space” is set to 0. 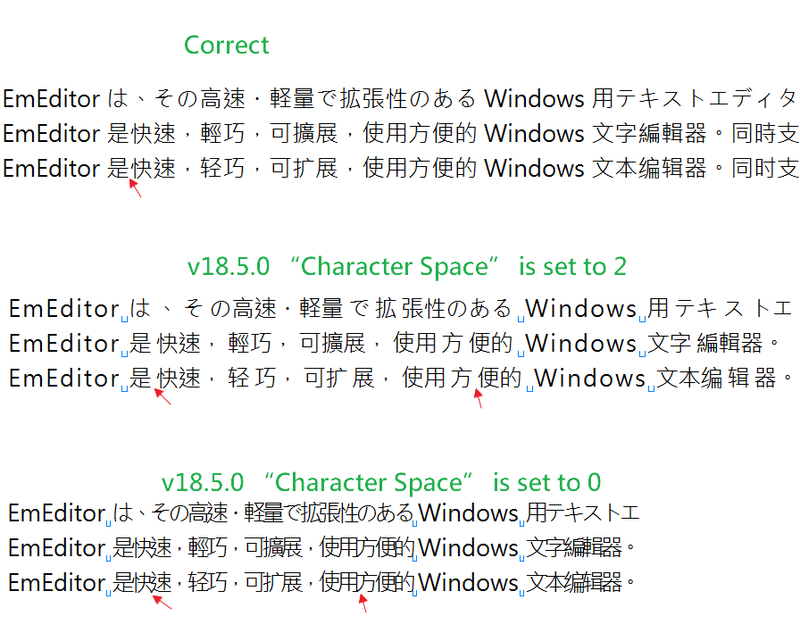 If “Character Space” try to use 2, still have problem. Some of words space will become bigger, but some of words space is correct. I received your sample file by email, and reproduced the issue. This will be fixed on the next version.